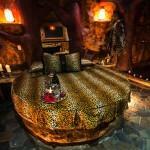 If close attention to detail is something you appreciate in a themed suite, our Cave Room is sure to impress. Carefully designed to simulate an actual cave, these prehistoric like features are sure to bring out your inner primal instincts. 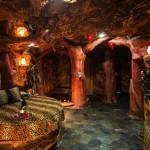 The entire room, including the bathroom and open shower area, was made to replicate weathered rock that closely resembles that of a real cave. Entering this jaw-dropping suite truly feels as if you’ve stepped into a time machine and transported back to the prehistoric era. 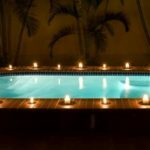 Couples of all kinds are sure to enjoy the round king sized bed, heart-shaped hot tub, signature love chair, and separate lounge with dance pole and bar. 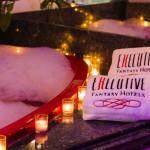 It is no surprise that this themed suite is one of the most popular options among our guests and is in such high demand. Experience the magnificence of our Cave Room today! For contact information or to send us a message with any questions or concerns, click here now! 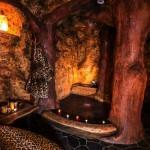 Come, play, dance, and unleash the animal within in this exotic “themed” Cave.